All Things Dog Blog All Things Dog Blog: Dog Parks Are Not Our Whole Life: Just Three Days a Week! Dog Parks Are Not Our Whole Life: Just Three Days a Week! Now that I have been a regular at my local dog park for two years, I don't have to introduce myself around much. Tanner, Xena and Oliver don't either. (Oh yeah, it's them again.) But this visit was different. 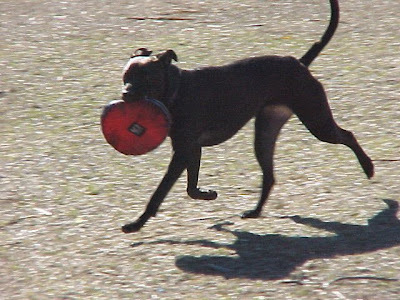 This cute boxer was here for the first time and she was enjoying a game of Frisbee with her owner. Her mom had quite an arm. I should have asked her for lessons. I throw like a girl! I have begun to share dog park photos and experiences with you in occasional posts for several reasons. One is that I think it is educational to see and hear about other's experiences at the dog park. Rumors abound, and they sometimes get out of hand. The one disadvantage I have is that with Tanner and Xena along, I cannot spend time in the small dog area. I suppose I'll have to give Oliver a one on one visit to bring you some small dog park stories. I have done this a few times in the past, and these experiences are considerably different. No paws on my shoulders or powerful dogs that look intimidating. In the small dog area I have found more of the "Napoleon Syndrome" or "Little Dog Syndrome", which is often found in small breeds who have taken ownership of their owner, house, car and are running the show. Surprisingly, these dogs are more common than aggressive bully breeds in the big dog park. I guess I shouldn't be surprised, as little dogs rarely get the same amount of training as bigger dogs for obvious reasons. 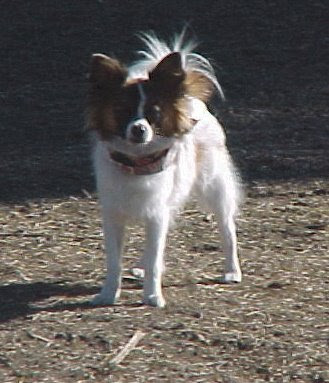 Owners believe that they can control the little dog easily because of their own larger size. But controlling a dog doesn't always come down to size. It's more about leadership and confident assumption that your dog will follow your lead....discipline. Have you ever watched Cesar Millan roller blade with a pack of 10 big dogs? Only a confident leader can get a whole pack of Rottweilers, Pit Bulls and other big dogs to cooperate that way. 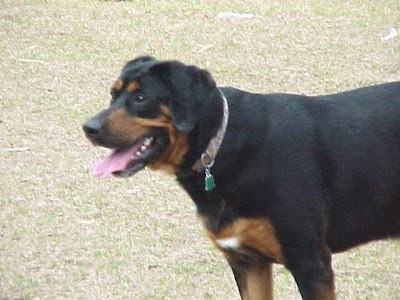 Speaking of Rottweilers, Oliver and this Rottie seemed to have the same ideas about what smelled good--each other. It was rather cute to watch him try to get his blocky head under Oliver's tummy for a side sniff. Oliver had the easier job, walking underneath and raising his nose to do the proper doggie hello. Oliver's confidence never wanes when greeting big dogs, which always thrills me. I realize that if he were to show anxiety or fear, he might be toast. On a recent visit to the park, Oliver was greeted by a large group of Pit Bulls who had met there for a play date. Oliver greeted them as if he were a Doberman and there was nothing to it. They returned the favor and the whole play date continued with Oliver running in the mix. He didn't seem to have a clue that at 8.2 pounds, he was not much more than a snack for a 60 pound breed of this type. Thank goodness for owners who care enough to train and supervise their dogs. Seeing to it that they get adequate exercise coupled with early and continued socialization all, most certainly, played a part in the success of this "party." To an onlooker, it may have appeared that Oliver, the only mini dog in the group, was the guest of honor. Yet Oliver had no idea that he was different. Should I worry? I guess the answer to that is "Not if Oliver doesn't." That's the approach I always took with my children and fears. If it scared them, they were more likely to get hurt. Activities that they felt confident about were safer than might have otherwise been expected, simply because the kids took part with a feeling of confidence that allowed them to follow through safely. Oliver just taught me something. Dogs are a lot like kids. My kids always loved the Carl books. I haven't seen this one yet, but I trust it is also a heart tugger. If you're a dog park lover and would like to learn more about helping to assure that our precious parks stay open during these uncertain economic times, check out Adopt a Dog Park. I hope you'll join me.